We’d love your help. Let us know what’s wrong with this preview of The New Urban Frontier by Neil Smith. To ask other readers questions about The New Urban Frontier, please sign up. I first read this in 2001/2002 doing research to inform community organising around gentrification and displacement. I confess my non-theoretical self didn't much like it. Most of it was over my head, and what wasn't seemed so obvious. Even so, the desire to help support movement and stop gentrification was so clear I always did want to meet Neil Smith. I'm sad I didn't get to. Now I find it much more useful, probably because I've done the hard work of going through Marx, figuring out Harvey's th I first read this in 2001/2002 doing research to inform community organising around gentrification and displacement. I confess my non-theoretical self didn't much like it. Most of it was over my head, and what wasn't seemed so obvious. Even so, the desire to help support movement and stop gentrification was so clear I always did want to meet Neil Smith. I'm sad I didn't get to. Now I find it much more useful, probably because I've done the hard work of going through Marx, figuring out Harvey's theory of rent and where the rent gap Smith relies on so much comes in and how differential and uneven development works and etc. I'm also a bit more forgiving of his needing to have impact in an academic environment that required (and still requires) convincing that gentrification was/is happening at all, that it would continue, and that it was/is an immensely painful, harrowing and heartbreaking process for those being forced out in which many people have lost everything. It's a collection of previously published articles, and in a way that makes it a little disjointed. I wanted some things to be more integrated, particularly the way that local urban development and global forces interact. This especially as it is so key to always remember that the suburbs and the inner-cities are connected just as the city is part of national and international flows of capital and investment. Unable to redevelop a heavily built central city envirobement, capital rolled out to the suburbs. Leaving the inner cities to literally fall apart as landlords milked their buildings for all they could (no one actually living in those areas qualified for mortgages or loan capital given redlining), a few decades and some arson and demolition later, these same areas were newly ripe for renewal. What I do quite like, however, is bringing all of the essays together you can see how Smith's thought progresses, and tries to answer some of the cultural questions around why certain areas are chosen and how discourse works to legitimise capital's power. My biggest critique is that while he gets class, and even does some work on gender, the racial analysis is almost entirely missing. I personally would argue that it is key to the process as in some ways Smith's own work makes clear. I love his calling out of how white gentrifiers talk about the city as another frontier they must conquer, how they see themselves as pioneers in some kind of wilderness inhabited only by the feral poor and some rats. But he doesn't go on to draw the parallels to how the entire country is founded on such ideas of conquest underpinned by a certainty of white privilege and ownership. Nor that the original frontier only disappeared with the final genocide of California's (and most of teh country's) Native peoples. Important to honor that difference I think, even while taking lessons about just what Americans are capable of, and how they justify just taking things. From today's perspective it is hard to remember that there was a recession in the late 80s early 90s and people were arguing there was a process of degentrification. Not Neil Smith. His analysis was right in many ways, particularly that white people were getting meaner. That everthing would just get uglier if that were possible, and that more and ever more would be lost. Empowering analysis of the gentrification process. Because if you know what's happening you have a better chance of stopping it. The most useful part of the book in terms of understanding cities is the chapter on the economic theory of gentrification, that economic incentives force landlords in a declining residential area to under-maintain their building, causing further deterioration of the neighborhood's housing stock until the buildings are so undercapitalized relative to the land value underneath that capital swooshes back in with rich people. (OK so this is kind of complicated for us non-economists but it's an impor The most useful part of the book in terms of understanding cities is the chapter on the economic theory of gentrification, that economic incentives force landlords in a declining residential area to under-maintain their building, causing further deterioration of the neighborhood's housing stock until the buildings are so undercapitalized relative to the land value underneath that capital swooshes back in with rich people. (OK so this is kind of complicated for us non-economists but it's an important theory) The role of artists and the rhetoric of "urban pioneers" is very interesting too. This is a truly wonderful book on gentrification. It analyzes the genesis, life, and (potential) demise of gentrification, both in terms of 'hard' economic data and in terms of a rhetorical analysis of the 'frontier' myths that accompany gentrification, both through close analysis of specific situations of gentrification and worldwide trends created through the spread of neoliberal economic policies. My only critique would be that the book ends up adopting the frontier myth in various ways, and This is a truly wonderful book on gentrification. It analyzes the genesis, life, and (potential) demise of gentrification, both in terms of 'hard' economic data and in terms of a rhetorical analysis of the 'frontier' myths that accompany gentrification, both through close analysis of specific situations of gentrification and worldwide trends created through the spread of neoliberal economic policies. Smith argues for a systematic understanding of gentrification, rather than a simple consumer-driven one. He does this in a convincing manner, relying heavily on a Harvey-esque examination of capital disinvestment. 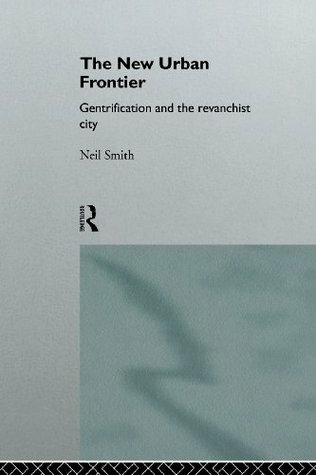 My chief complaint is that after his fascinating introduction, Smith pretty much drops the cultural analysis of the "urban frontier" myth, which I found fascinating. I want to give this book a higher rating but its super dry and academicky. It is however a highly valuable contribution to the study of gentrification and holds many insights to the processes that reshape our cities. interesting and convincing; perhaps not as tightly structured as it could have been. Several different Neils Smiths tend to collect here.